Today's giveaway is brought to you by Cheerfully Charmed. Cheerfully Charmed provides hip and sophisticated accessories to bring any wardrobe up to date. They are well known for their statement necklaces that come in a variety of colors. Cheerfully Charmed is giving you the chance to win a necklace of your choice from their lovely store. *This giveaway is open to Dearest Lou readers in the US only. Winner will be announced on or after Wednesday November 14th. Winner will have 7 days to claim their prize by emailing me at dearestlou at gmail.com or another winner will be selected and contacted via email. Winner will be chosen randomly using random.org. 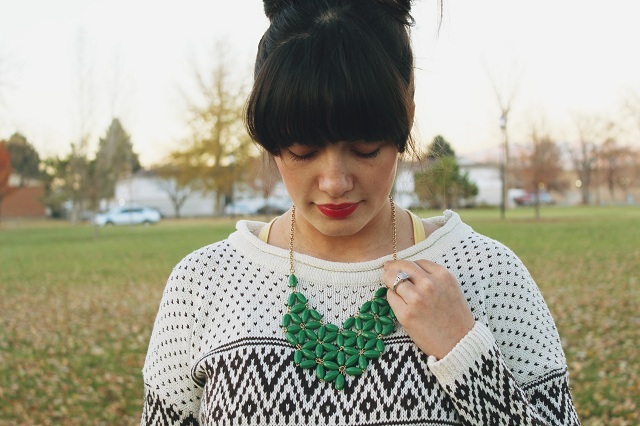 I'm a follower and I love the necklace you're wearing but in turquoise or coral! I love the red bubble statement necklace! i follow your blog! love the color adorned bib necklace! I follow you with GFC. I love the white bubble necklace! I'm following on Instagram (@thetinyheart). I adore the Orange Droplet Statement Necklace. Also following you via Bloglovin. Also following you on Instagram from @thingsicovet. I follow via Bloglovin - I love the Coral Adorned Bib Necklace! I follow you and I am in LOVE with the gray bubble necklace!! I love the fuchsia bubble necklace. It's gorgeous! I follow you on twitter and i love the blue bubble necklace! I follow you via GFC :-) I'd love the Sunray Droplet necklace. I follow you via Bloglovin' and my fave necklace is the Coral Adorned Bib Necklace. I love the adorned bib necklace or the bubble necklace! Such a cute necklace! I follow via GFC; love the Coral Adorned Bib necklace - the color is perfect. My favorite necklace is the Cobalt blue adorned...so gorg for fall! I posted this giveaway on my facebook page! Followed Cheerfully Charmed on Instagram! i'd LOVE one of the bib necklaces! follow cheerfully charmed on instagram! Pretty necklace! If I win, I would to have the Turquoise Bubble Bib. I follow you on bloglovin, GFC and IFB. I also follow @cheerfullycharmed on Instagram. Below are my links and e-mail address. Followed on Bloglovin and I love, love, love the White Bubble Necklace! following via GFC & I love the bubble necklace in yellow! P.S. I see another Celeste commented just above me, I promise I am a different Celeste! just came to say i just found your blog and i loved it, so you just gain a follower! I love the White Adorned Bib Necklace! Following on Instagram as well, as hilraiser. I follow via GFC (and it was so nice to meet you on Saturday at Gentri's!). I love the bib necklaces at Cheerfully Charmed right now.